There are days when quick and easy is not quick enough.You know when you can’t or don’t want to order from outside but need something awesome urgently!That’s when I fish out my Pasta in Butter Garlic Sauce recipe- its quick, its easy and it needs only bare minimum ingredients. I have been making this pasta since I saw an episode of Masterchef where the contestant made a giant egg ravioli coated with burnt butter garlic sauce.It looked so so perfect.That was about 5 years ago and I have been smitten which this way of eating pasta ever since. If you are a moody person like I am and have too many of those days when indulgence is the only answer, then my friend this pasta in butter garlic sauce recipe.I have a lot of other great pasta sauce recipes on the blog which can take anywhere between 20 minutes to an hour- like the quick cherry tomato sauce which takes minutes or the roasted tomato and pepper sauce which needs to be in the oven for minutes but really there is no other sauce that can be rustled up in 2 minutes flat. In my dictionary nothing could be better than pasta generously coated with brown butter,oodles of garlic and herbs and the fact that it’s fuss free and quick to rustle up is always a big thumbs up for me.The only problem with this pasta is that because it’s stupidly easy to make it has been my quick fix indulgence one too many nights. 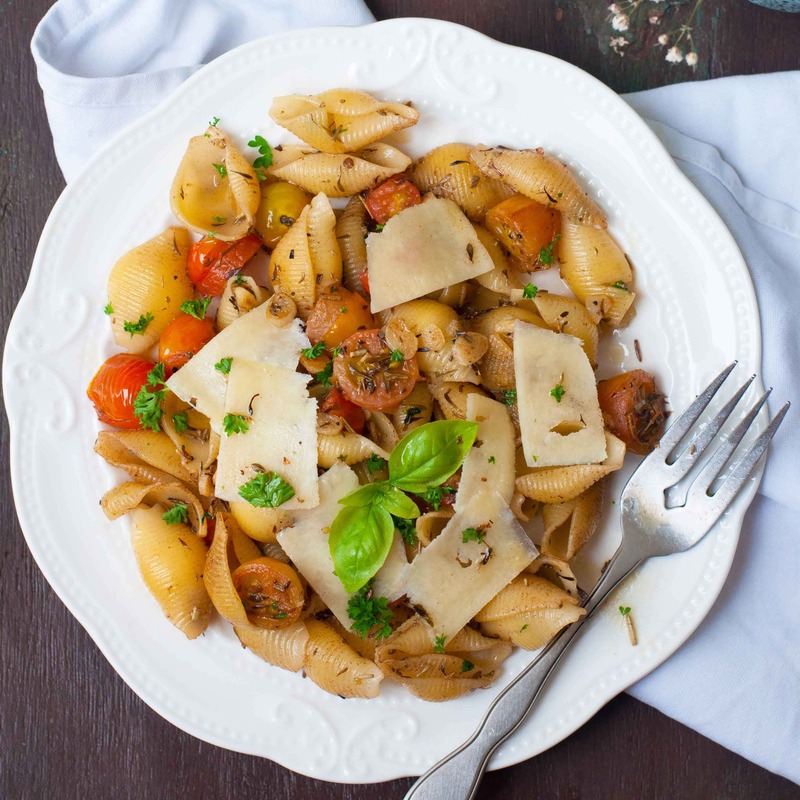 I like this pasta the best with some bacon because its imparts such a complex salty – fatty flavour but my goto vegetarian version is this with some juicy cherry tomatoes. Let’s talk about how you cook pasta– Everybody knows how to cook pasta right?Read the package instructions and follow to the T.but I have two tips for you which will make cooking pasta easier for you! 1. Always Always cook pasta in salty water. 2. Rinse the pasta with cold running water afterwards so that it doesn’t stick together into clumps. If you are looking for more such recipes then you are in the right place.I have so many pasta favourites! Try out my 1000 times over tried and tested Roasted tomato sauce for both pastas and pizza or my amazing cherry tomato sauce.I also have an amazing light pasta salad recipe – Do try Light Pasta Salad with gorgeous cilantro dressing I am sure you will love the dressing. The best part about this recipe is that you can make your own version of this dish with whatever you have in the fridge.Add zucchini,bell peppers, spinach leaves, bacon,left over roasted Chicken..Really anything! You could also use chicken or duck fat or bacon fat instead of butter if you wish. Heat the pan on high. Add butter and oil.Once the butter starts melting add the garlic. Next Sprinkle the mixed herbs next followed by tomatoes and cook for about 30 seconds. Spoon in the cooked pasta next and coat generously with the butter sauce.